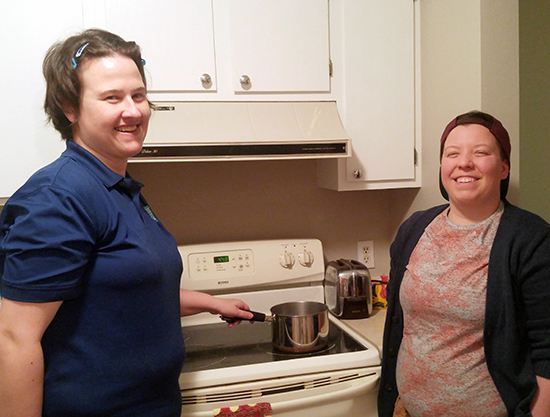 Kristen (left) and Maddie have cooked up some great ways for Kristen to experience success with independent living. Her connection to Reach goes back over a dozen years, when she began receiving support for independent living. And learn to live independently she has! With a driver’s license and a steady job, Kristen gets out and about in the community, particularly being active with Special Olympics. But when she’s ready to unwind, she curls up at her own condo with her cat, Ditter. Maddie helped Kristen get settled there this past summer. Although it’s not Kristen’s first experience living on her own, she’s thrilled with her new location, where she is close to walking trails and enjoys various other amenities within the complex. The “good one” currently in question is someone she met during Reach’s On The Town program. Kristen looks forward to the group dinners out and going to movies. “I’ve made a lot of friends,” she says. Beyond the local scene, Kristen spends time traveling with her family, and has stamps for Peru, Norway, and Mexico in her passport. She has even ventured on her own, like when she flies to visit her sister in Colorado. Kristen is a shining example of someone who has made great strides in gaining more independence. Lighting the way are her dazzling smile and infectious personality.